Apologies for the lack of updates in recent weeks – work has been rather all-consuming! To be honest, it’s not been so bad to be indoors – a persistent high pressure system, combined with very slack winds, have seen a blanket of smog covering Beijing with poor visibility and, at times, appalling air quality. The US Embassy ‘twitter feed’ is updated hourly and rates the pollution levels of PM2.5 (a particulate pollutant) and ozone. “Particulate matter, or PM, is the term for particles found in the air, including dust, dirt, soot, smoke, and liquid droplets. Particles can be suspended in the air for long periods of time. Some particles are large or dark enough to be seen as soot or smoke. Others are so small that individually they can only be detected with an electron microscope. Many manmade and natural sources emit PM directly or emit other pollutants that react in the atmosphere to form PM. These solid and liquid particles come in a wide range of sizes. There is a scale of descriptors ranging from “Good” to “Hazardous”. Last week saw several days with the pollution at “hazardous” levels. I am not exactly sure what “hazardous” means but at these levels, you can taste and smell the pollution when you step outside. Not pleasant. Of course, the Chinese media describes the smog as “fog” and on one dark day last week, it was laughable that the media was saying that there were “boundless blue skies over Beijing”… Of course…. Fortunately, this smoggy period seems to be breaking now and on Sunday I visited Ma Chang/Wild Duck Lake with Libby and a couple of UK friends John and Sarah Gallagher. They have been keen to accompany me on one of my birding trips for some time and so, with a window of decent weather and visibility, we grabbed the chance before the winter sets in. We enjoyed a very good day. The visibility was above average and, when the cloud broke in the afternoon, it turned into a gorgeous late autumn day…. Cloud 8/8 and 5 degrees C at 0640 with very light north-easterly wind. 13 degrees C, cloud 3/8 and light north-easterly at 1500. Visibility above average all day. The highlight was my first Great Bustard in China (a flyover), 2 Black Storks, 6 White-naped Cranes, 58 Common Cranes, Upland Buzzard, 2 Short-eared Owls, 2Common Starlings. 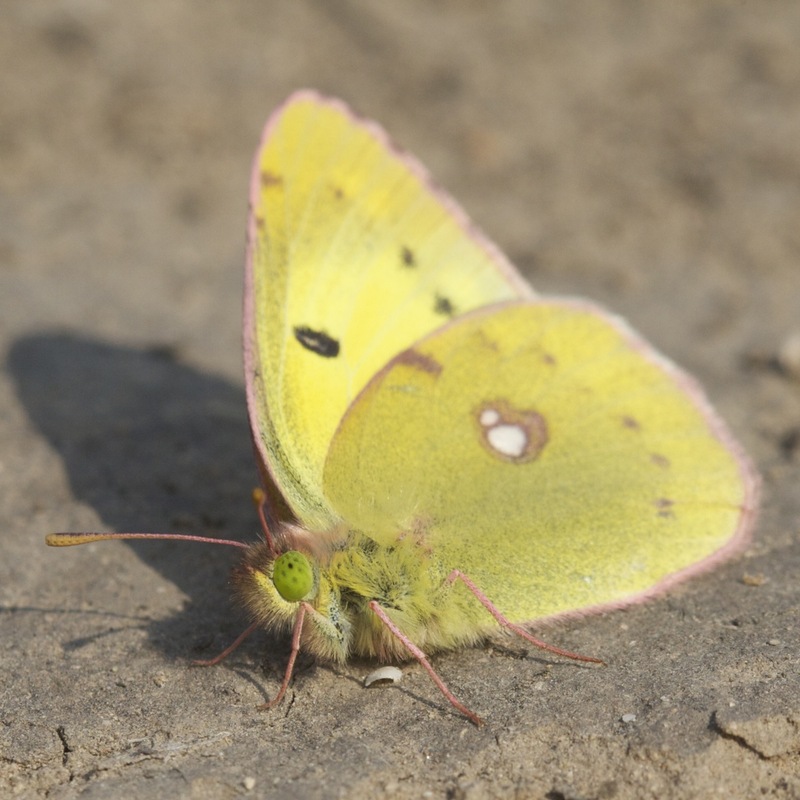 Finally, we enjoyed excellent views of this yellow butterfly, the only butterfly we saw. It was a little sluggish, allowing close photography, in contrast to the many times when I have tried to photograph this species in the spring/summer.. I am not sure what the specific species is but it’s pretty common in the area. 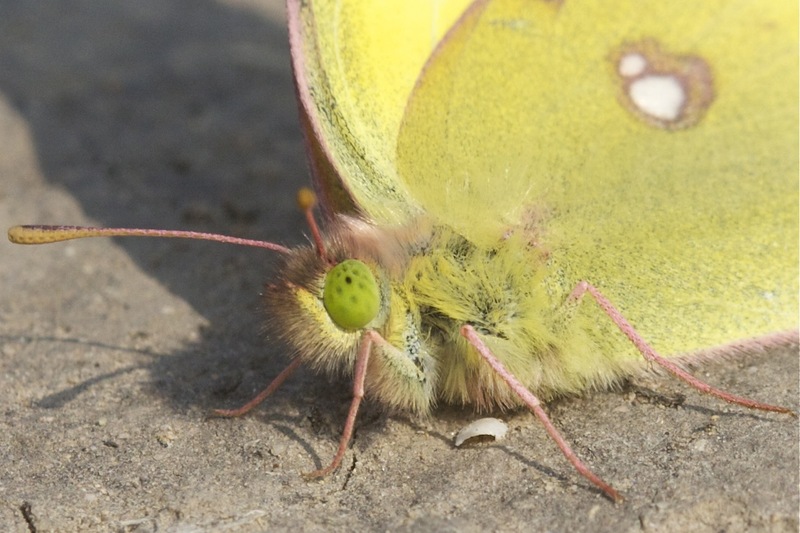 EDIT: Thanks to John Furse for identifying the butterfly as a Clouded Yellow. Close up... I love those eyes!